The next day, I awoke in a state of longing and grief that penetrated to the core of my being. I was devastated about the conditions of my life. I was angry about being a human, about having to live my life away from the dolphins. I was crawling inside my skin, trying to get out. None of this made any sense to my human mind, yet I couldn’t make these thoughts and emotions go away. I couldn’t shake the despair. My questions were unceasing. Who am I, really? Am I a dolphin in a human body? What does that even mean? Why did I have to be a human in this lifetime? What is this all about? I was angry and confused. Part of me wanted desperately to return to the dolphins, in my dolphin form. At the same time, I was terrified that if I became a dolphin again, even energetically, I might not be strong enough to come back. The isolation was total. At that time, I knew of no other human who felt as I did. I knew a lot of people who loved dolphins, but I didn’t know anyone else whose life was completely taken over by them. I felt utterly alone, and I thought I was going crazy. Meanwhile, a portal had opened up inside me. Dolphin consciousness began to bubble forth and permeate my being. I began to remember, and know, what it was like to live as a dolphin. 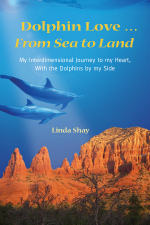 In my dolphin lives, our interactions with each other and our environment were loving, joyous, and harmonious. We lived in a perpetual state of oneness, that elusive state of consciousness we humans spend entire lifetimes striving to attain. For dolphins, oneness is our natural state. As a dolphin, I was loved, loving, happy, deeply nourished, and fulfilled. I became ultra-sensitive to the cruelties and harshness we humans so casually inflict upon one another every day of our lives. With each infraction, large or small, I felt the pain of it in my body. How can we be so cruel? How can we be so hurtful to people we love? My desensitization to the human condition began to unravel. I frequently became so overwrought that I’d burst into tears. David would hear me, and he would come and hold me until I was empty inside. Neither of us knew what to do for me. There didn’t seem to be an answer. For whatever reason, I needed to pass through these dark spaces. I needed to see what I was seeing, and feel what I was feeling. I vacillated between struggling with the dark side of humanity and embracing the bliss of my awakening dolphin nature. I preferred life as a dolphin. I wasn’t at all sure where this journey was leading, and if it was, for that matter, a good thing for me.